"These guys are talking about bangs and shimmies up there. That doesn't sound like instrumentation to me." The Apollo 13: 20th Anniversary Blu-ray disc is included with this set. To read a terrific review of that disc, click here. Truth be told, I don't have a whole heck of a lot to add to the Apollo 13 review. We gave it Five Stars two years ago and I stand by that assessment today. Over the past 22 years, it isn't too difficult to state that it's perhaps director Ron Howard's best film and also features one of Tom Hanks best performances. If the man could win an Oscar for Forrest Gump, I can't explain how the guy didn't even get a nomination here. The supporting cast is pitch-perfect featuring amazing turns from Kevin Bacon, the late great Bill Paxton, and Gary Sinise. And that's not even mentioning the equally impressive Oscar-nominated performances from Ed Harris and Kathleen Quinlan. For me, it was my favorite flick of 1995. I turned thirteen that summer so naturally the numerical significance wasn't lost on me. It's the one that I saw in theaters over and over again. I just couldn't get enough of it. I loved the sense of adventure that comes from traveling out into the unknown. I loved the human drama of a story of survival that required the cooperation of hundreds of people to bring three men home alive and how this feeds a constant sense of human accomplishment throughout the film. It really is incredible when you think that within a span of ten years space travel went from being mere theoretical science to a man walking on the surface of the moon. On top of the previously mentioned cast, this film also sports my favorite score from the late James Horner. Sure he was also nominated for the equally grand and impressive Braveheart that same year, Apollo 13 still tops it in my opinion. The blast off sequence alone makes the score. It's an equal combination of tension and suspense and joyful release as the astronauts get ready, board the spacecraft, the engines ignite and then the rocket hurls towards space. It's a beautiful sequence. In reality, I think I kept going back to the theater just to see that scene again and again. Apollo 13 may have been my favorite movie of 1995, but it was a packed year. As I said, I turned 13 that year and it made it significantly easier for my parents and my older sister to take me to R-rated movies. 1995 felt like the first year where I somehow managed to catch all of the major flicks in the theater. The previously mentioned Braveheart, The Usual Suspects, Heat, hell - I probably went to see Se7en at least four times alone. 12 Monkeys introduced me to the wild mind of Terry Gilliam. Casino was the first Scorsese movie I saw in the theater. I experienced my first migraine headache during Waterworld (I still love this movie but that was serious pain to endure for two hours). Desperado proved that action movies could be cool as hell. But through it all, Apollo 13 stayed on top. To this day I pull this movie out at least once a year - if not more. Like The Good, the Bad, and the Ugly, if it's ever on TV and I happen to stumble upon it, I stop everything and finish it. If you give this movie just a couple minutes of attention it's nearly impossible not to see it through to the end. Sure, there's little mystery left as I know the outcome of the movie, but I get wrapped up in it just the same. Of all the great movies of 1995, I've easily seen Apollo 13 the most. I wore out my VHS tape, a put a few scratches on my DVD, went through both Blu-ray releases and now I'm onto 4K UHD Blu-ray. Simply put, it's one of a handful of movies that no matter what format it's on, It'll always be a part of my collection. Apollo 13 arrives on 4K Ultra HD Blu-ray courtesy of Universal Studios in a two-disc Ultra HD Blu-ray + Blu-ray with Digital Copy set. Both discs are housed in a standard sturdy black Ultra HD Blu-ray case. The disc loads directly to a static image main menu with traditional navigation options. The standard Blu-ray disc is the exact same one included with the 20th Anniversary release. Given the success of 2015's 20th Anniversary release and the new remaster that was supplied for that disc, I wasn't too sure how much better things could get with this 4K UHD release. Maybe it has something to do with all of the iffy Blu-ray releases over the years that gives me pause about any significant upgrades for this format, but catalogue titles continue to surprise me. With this new 2160p HDR10 presentation, Apollo 13 makes another grand leap on home video. Admittedly, I wasn't initially blown away when I popped in this 4K UHD disc. Things looked improved sure, but I found it difficult to tell how much. As it'd been awhile since I last spun the 20th Anniversary disc, I wasn't seeing the big improvements one might hope with the format. Then I put in that disc to do a little comparison, and yeah, the upgrades in clarity, color, contrast, and image depth become instantly apparent. The first big thing I noticed was the improvements HDR10 brought to the colors and flesh tones. I would describe the 20th Anniversary release as looking a little pinkish (not to say that blues and yellows were drastically affected, but just enough that the color red would look a little hot making some of the actors look a little more pink than natural). On the UHD disc, colors are bold, primaries are vibrant, reds have a beautiful pop and flesh tones appear a little more healthy/tan than before. This actually helps when it comes to hiding Ed Harris' rather orange-looking hairpiece that was glued to his noggin appear more natural. Black levels and contrast are spectacular as well giving the image some terrific depth. Now, much like the 20th Anniversary, release, this 4K UHD release does expose some visual effects faults. Any scene where CGI was used to fill in some gaps becomes glaringly obvious because of the enhanced resolution. The worse offenders appear during the launch sequence where the lines between practical models and CGI are very obvious. However, these shots are thankfully brief and really only appear during the time leading up to the launch. Once that rocket is moving, everything looks terrific. Considering how great the 1080p presentation was for the 20th Anniversary release, this 4k Ultra HD Blu-ray transfer only amplifies all of the best qualities of the film for the best possible presentation to date. Where the goose really starts cooking for this 4K UHD Blu-ray release of Apollo 13 is with the new English DTS:X mix. Damn. That's really all I need to say. Damn. This is an impressive mix all around giving one hell of an immersive presentation. The launch sequence, the explosion, and the alignment burn where there is a cacophony of dialogue, sound effects, and James Horner's score all sound terrific with surrounds and vertical atmospherics working in perfect harmony. By comparison, the DTS-HD MA 5.1 sounds rather wimpy. Where the audio was once impressive on standard Blu-ray, the DTS:X blows it out, especially in the LFE department. That launch sequence was particularly exciting to have with the volume turned way up! Felt like I was back in the theater seeing it for the first time again. When the movie is a bit more on the calm side without explosions and the crew barking orders at each other, the mix is pleasantly stable with a great sense of atmosphere. Surround channels kick in when and where needed maintaining a presence without overpowering the mix. It's especially nice during the scene where Apollo 13 goes on the dark side of the moon and the film lets James Horner's score take over practically the entire thing. It's a wonderful effect, to begin with, and the added atmosphere and dimension is great. Like the video transfer, this DTS:X mix is a notable improvement. Since the 20th Anniversary release disc is included in this set, all previous bonus features from that disc are still included. 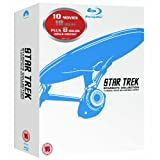 However, the excellent Ron Howard Audio Commentary, as well as the Jim and Marilyn Lovell Audio Commentary, are included on the 4K UHD disc. If you've never heard either commentary you should absolutely give them a listen. It's still a great set of bonus features that outside of not including the IMAX cut of the film, this is a pretty complete feeling package. Audio Commentary featuring director Ron Howard. 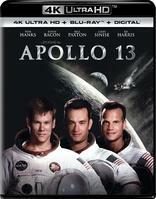 Audio Commentary featuring Apollo 13 astronaut Jim Lovell and his wife Marilyn. Apollo 13 is a classic in my book, through and through. It's possibly Ron Howard's best film and one of the best films to come out of the 90s. It's a true story of adventure, survival, and human ingenuity. It was a favorite of mine from the first viewing in theaters and it has remained so for the last 22 years. With so many home video releases over the years, I wasn't sure how much more gold could be mined out of this film, but somehow Universal managed to dig up a little more. The new video transfer is excellent - even if it does highlight the film's early CGI effects - it's still a beautiful looking image. Added to that, the new DTS:X mix offers a nice upgrade to an already impressive audio mix. As for making the purchase, I think it's an easy one to recommend, but that said, given that this film was just given a special edition release hardly two years ago a double or even triple dip may be tough to sell for some folks. However, if you're a 4K UHD Blu-ray fan and are looking to add this to your collection, you should be very pleased with the results.